Manifiesto "por James Bocchio", Lima, Peru. The restaurant Manifiesto is the physical expression of Peru's vast and rich culinary culture (considered one of the 3 best cuisines in the world, along with the Italian and French). 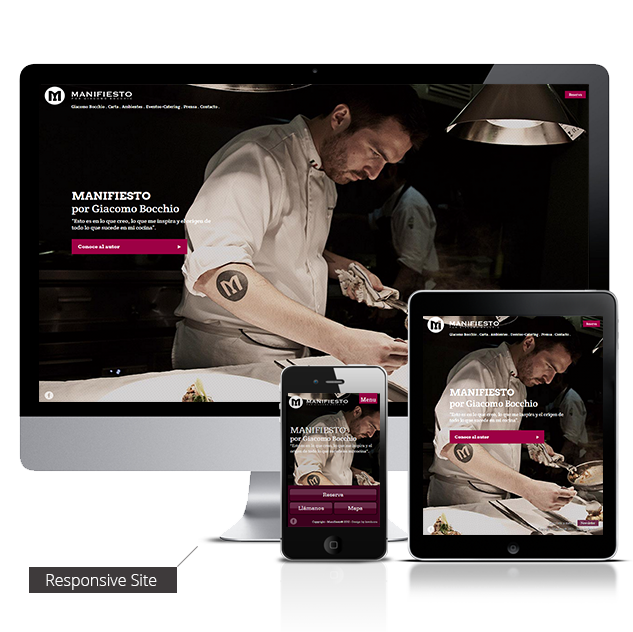 It communicates the experience of the chef, who has worked, throughout his career, in some of the finest restaurants in the world and who teaches in the most prestigious culinary schools and has successfully participated in fairs and competitions. 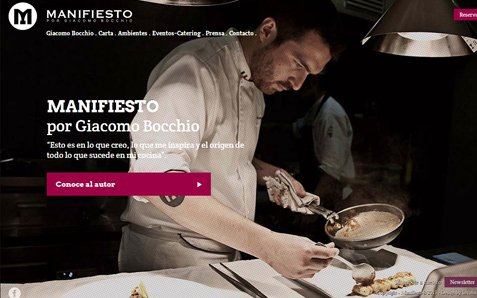 The restaurant Manifiesto has received international recognition: it is ranked among the 50 best restaurants in the world and is on the top 10 list of restaurants in Peru. Manifesto moves toward being a world-class restaurant, opened to all those interested in enjoying the fusion of haute and gourmet cuisine, taking into consideration different options depending on the different levels of culinary experience of its customers. From a strategic point of view, a need to strengthen the image of Giacomo Bocchio's experience as a chef emerges: his being sociable, creative and having a wide gastronomic culture and creating an association with the restaurants' name. 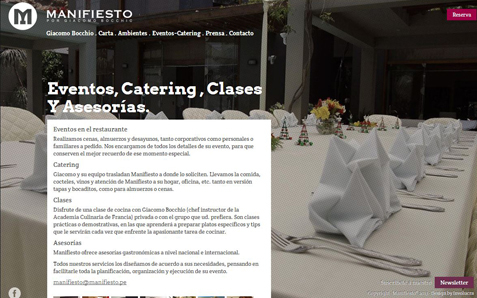 The restaurant Manifiesto becomes an open place where one can learn about food culture. The repositioning of the restaurant from an image point of view respects the product repositioning, according to which the menu has to intercept the tastes of two targets: gourmets and "wannabes" (customers with little gastronomic culture but with great financial resources). 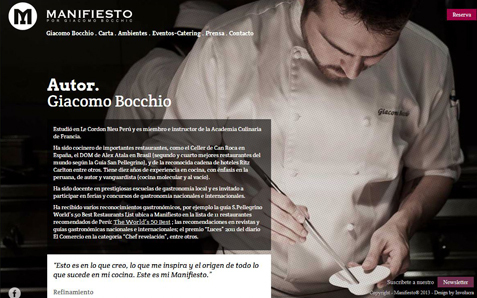 Right from the homepage, the website communicates a strong interconnection with its chef's image, Spanish for "author", which explicitly conveys the culinary art that he represents: inspired by his homeland, Peru, but strongly contaminated by his international experience. 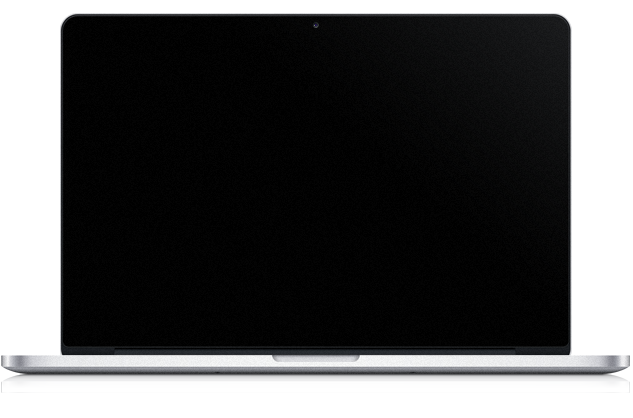 The choice of using a texture with very dots made it possible to use large evocative images in the background, allowing the users to immerse themselves in the world of Manifiesto without diverting attention from the textual information (menus, events, press). 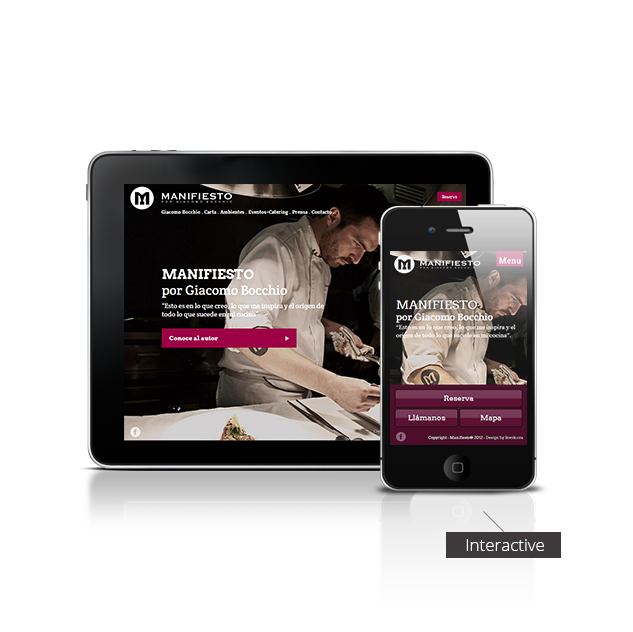 The mobile site has 3 important calls to action which are essential for the restaurant: "reserve" (from the calendar), "call" (direct connection to the phone no. ), "map". Within a wider internet marketing strategy, which involves the use of Facebook as the main channel, along with a rich digital PR and press activities, we started a SEO campaign to support the launch of the new website.